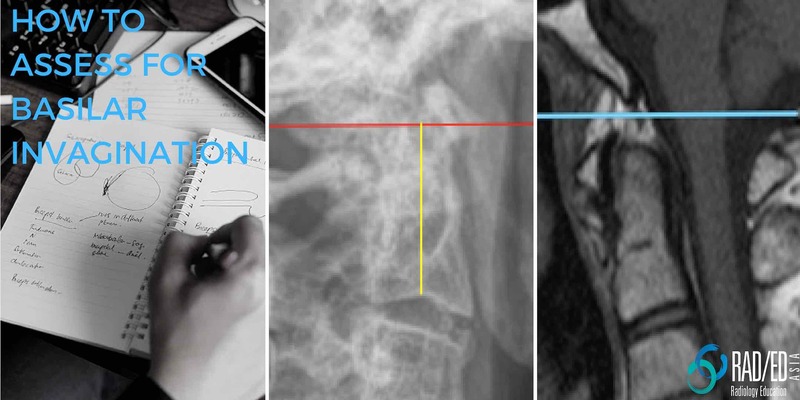 Subluxation at C1/2 in Rheumatoid Arthritis can occur in three directions. Axial ( Horizontal), Vertical and Lateral. Vertical subluxation is when C2 moves proximally towards the foramen magnum and is called Basilar Invagination or Basilar Impression. 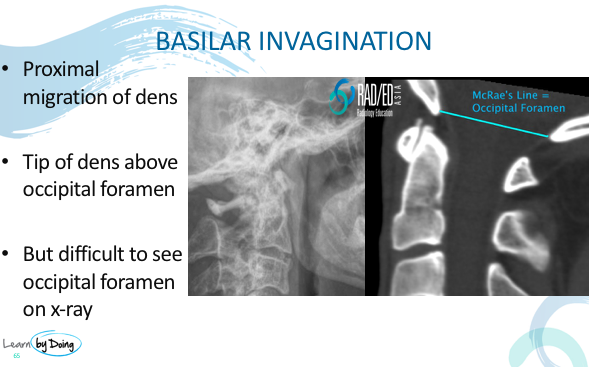 Basilar Invagination is when there is abnormal underlying bone and Basilar Impression is used when the underlying bone is normal. 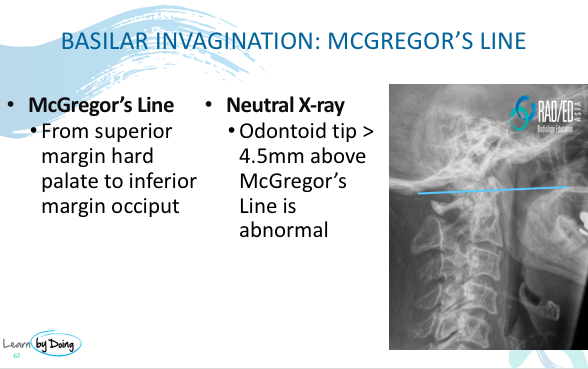 Image Above: McRae’s Line is drawn from the anterior to the posterior margin of the Occipital Foramen. But on a standard lateral xray its difficult to see the Occipital Foramen. So other methods ( see below) have to be used to determine if the dens has migrated proximally . 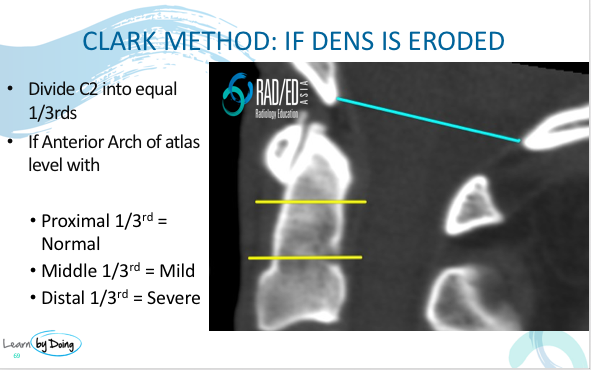 There are a number of ways to assess for basilar invagination depending on whether you can adequately see the dens on the lateral x-ray or not. 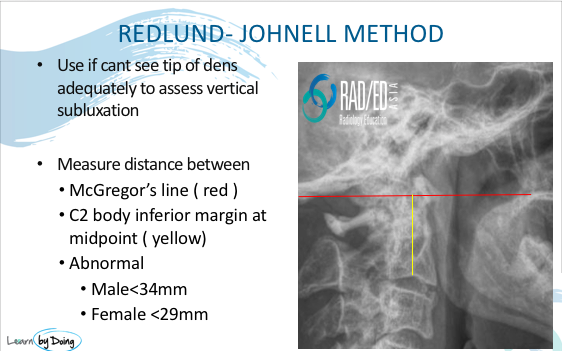 Drawing lines are the favourite activity of radiologists but these are relatively straightforward and the images below can be used as a reference when required. 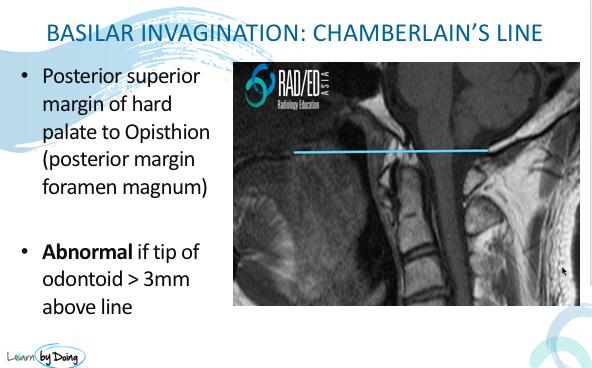 Chamberlain’s Line can be difficult on a lateral x-ray to see the posterior margin of the foramen magnum. So the line below ( McGregor’s line) is easier to use.